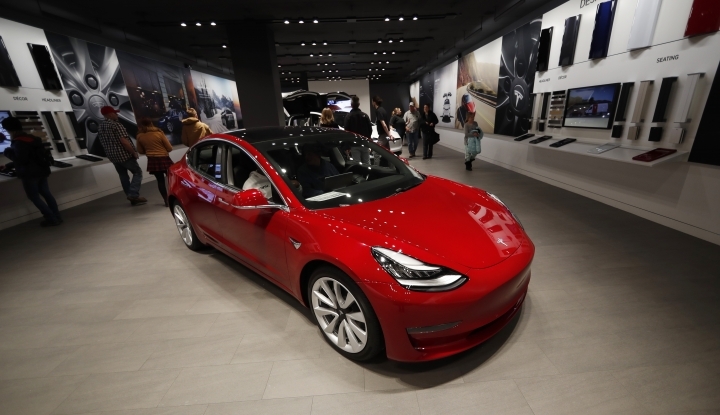 SAN FRANCISCO — Tesla will only sell its electric cars online as it accelerates its cost cutting so it can realize its long-running goal of selling a mass-market sedan for $35,000. The change announced Thursday will allow the Silicon Valley automaker to begin selling its Model 3 for $35,000 — a price point that Tesla CEO Elon Musk has been striving to reach in order to appeal to more consumers and generate the sales the company needs to survive. The cheapest Model 3 that could be ordered before Thursday started at $42,900. To save money, Tesla will close many of its stores, but leave some open as galleries or "information centers" in high-traffic areas. Musk declined to specify how many stores will be closed or how many employees will be laid off. The company has 378 stores and service locations worldwide. "This is the only way to achieve the savings for this car and be financially sustainable," Musk told reporters during a conference call. "It is excruciatingly difficult to make this car for $35,000 and be financially sustainable." The online sales shift will enable Tesla to lower all vehicle prices by 6 percent, on average, including its higher-end Model S and Model X. Although he said going online-only was a difficult decision, Musk believes it's the right one. "It's 2019," he said. "People want to buy things online." That is particularly true of younger, technologically fluent consumers who already are accustomed to buying almost everything at Amazon and having it delivered to them quickly, said Karl Brauer, executive publisher of Kelley Blue Book. Musk "doesn't need the whole world to buy into this," Brauer said. "All he needs is the same basic demographic that has been interested in his cars from Day One." Although he said he didn't know for certain, Musk predicted there's enough pent-up demand to sell about 500,000 Model 3s annually at the starting price of $35,000. But buyers will have to wait far longer than they do when shopping on Amazon. A U.S. consumer who places an order for the Model 3 at its new lower price now will likely get it by the end of June before a tax credit for electric vehicles is scheduled to be reduced, Musk said. The store closures will come on top of a decision to cut 3,150 jobs , or about 7 percent of Tesla's workforce, announced earlier this year. Despite the austerity measures, Musk told reporters Tesla will lose money in the current quarter ending in March, backpedaling a statement he made last October when he pledged the company would remain profitable from that point on. But Musk said it's "likely" Tesla will bounce back with a profit during the April-June period. Tesla's stock fell 3 percent in extended trading after the news came out. The Palo Alto, California, company is slashing costs just a few months after paying half of a $40 million settlement of a case that the Securities and Exchange Commission filed against Musk last September after he tweeted that he had lined up financing for a potential buyout for the company. The SEC alleged Musk misled investors after concluding he didn't have the money to pull off the deal. The SEC has asked a federal judge to hold Musk in contempt after he posted another tweet about key Tesla information without getting company approval as required in the settlement of its previous case. Musk declined to take questions about the SEC's attempt to hold him in contempt — an action that legal experts say could culminate in him being forced out as CEO in a worst-case scenario.